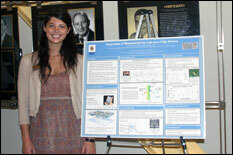 Gillian Costa, of George Washington University, is the 2012 MERIT-BIEN Overall Winner. The annual fair showcasing undergraduate summer research projects from the Maryland Engineering Research Internship Teams (MERIT) Biosystems Internships for Engineers (BIEN) program and the Training and Research Experiences in Nonlinear Dynamics (TREND) program was held at the Jeong H. Kim Engineering Building on Friday, August 3, 2012. MERIT-BIEN and TREND constitute a unique, 10-week summer research program that offers top undergraduate engineering, mathematics and physics students from around the country the opportunity to engage in cutting-edge, team-based, cross-disciplinary research projects at the University of Maryland. MERIT-BIEN projects range from nanotechnology and microelectronics devices to autonomous control, information security, system modeling, and speech recognition. TREND projects included centrifugal plasma confinement, magnetic reconnection and the dynamics of energetic particles, nonlinear dynamics in charged particle beam systems and optical systems, and the dynamics of soft matter and chaos. The MERIT-BIEN award for Best Overall Project went to Gillian Costa, a rising senior at George Washington University. Her project, titled "Integration of Biomaterials for Lab-on-a-Chip Devices," focused on the development of a portable device allowing point of care analysis of clozapine, an antipsychotic drug for schizophrenia treatment. This lab-on-a-chip device will be used in point of care situations to dramatically improve mental health treatment management. The faculty advisor for this project was Professor Reza Ghodssi, and the research was co-advised by Dr. Hadar Ben-Yoav. The MERIT-BIEN runner-up for Best Overall Project went to Garrett Wenger, a rising senior in ECE at the University of Maryland, for his project, titled "Synthetic Flocking and Quorum Sensing." He applied the theory of quorum sensing to robotic navigation and dynamic obstacle avoidance, similar in nature to how flocking starlings avoid peregrine falcons. Since robots are not necessarily contained in a fluid medium, the quorum sensing has been applied temporally, wherein all members of the “flock” communicate with a server. By changing the parameters of this communication channel, he have found evidence that increasing symbol drop probability reduces the flock’s ability to avoid a predator, sometimes resulting in the capture of one or more flock members. The faculty advisor for the project was Professor P.S. Krishnaprasad. The MERIT-BIEN award winners for Best Presentation were Peter Mariani who studies electrical engineering at the University of Maryland and Minh Tam Nguyen of Montgomery College for their project titled, “Active Mapping with a Bat Inspired Sonar System.” Their research focused on the development of methods for dynamically changing the sonar characteristics (loudness, transmission angle, system orientation, etc.) in response to the quality of processed echoes. The faculty advisor for this project was Professor Timothy Horiuchi and the co-advisor, Tarek Massoud. The MERIT-BIEN award for Best Written Report went to Stacy Hand of the University of Delaware and David Shiao of the University of Maryland for their project, titled "Integration of Distance-Only Sensing for Miniature Robots." Their aim was to improve distance sensor accuracy of these robots through a new design and layout of the distance-only sensor board and to alleviate the source of system clock timing jitter. They also proposed a new system chassis to reduce motor noise transmission. The faculty advisor for the project was Professor Pamela Abshire of the University of Maryland, with co-advisor Michael Kuhlman. The TREND award for Best Overall Project went to Kevin Hu, a student at Duke University. His project, titled “Effects of Nanoscale Topography on Palladin Dynamics,” examined the dynamics of the protein paladin and tracking its movement and velocity in cells on nanogrooved surfaces. The faculty advisor for this project was Assistant Professor Arpita Upadhyaya. The TREND program judges selected two teams as runners-up for Best Overall Project. The first runners-up named were Diego Alcala, studying at the University of Northern Colorado, and Katherine Sytwu of Rutgers University, for their project, titled "Explosive Percolation on Directed Networks." Past research has shown that if connections are competitively added in undirected complex networks, the formation of a giant connected component can be delayed, resulting in a forst-order transition known as explosive percolation. Investigating this theory in relation to directed complex networks we established that the giant out component also undergoes explosive percolation. The faculty advisors for the project were Assistant Professor Michelle Girvan with co-advisors Professor Ed Ott and Professor Thomas Antonsen. The second named runner-up for TREND's Best Overall Project was Alexandra Day, a student of Wellesley College, for her project, titled "Rejuvenation of a Cesium-Based Dispenser Photocathode in Response to Atmospheric Contamination." Her work and study focused on improving the quantum efficiency of cesium-based photocathodes for use in ship-based missle defense FELs. The advisor for the project was Research Associate Eric Montgomery. This year, 12 students participated in the MERIT-BIEN program, while 10 students participated in the TREND program. The MERIT-BIEN program is supported by the National Science Foundation (NSF) while the TREND program is supported by NSF and the Department of Defense (DoD).